Iran is planning to launch another monkey into space soon, according to media reports. The Iranian newspaper Jomhuri Eslami reported Sunday (Oct. 13) that the Islamic Republic aims to blast a monkey into space sometime in the next month, according to the French news agency AFP. The liftoff would help advance the nation's stated plans to put a human in space by 2018, Iranian officials said. The liftoff wouldn't be Iran's first simian suborbital space mission. A 2011 attempt failed, but then the Islamic Republic claimed in January of this year that it had lofted and safely recovered a monkey after a brief suborbital flight. 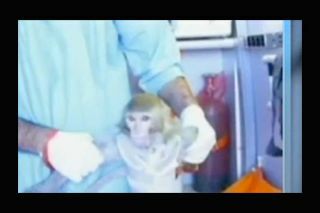 However, many Western observers remain unconvinced that this latter attempt actually succeeded, partly because the monkey that Iranian officials showed to the media after the supposed recovery was a noticeably different animal than the one that had blasted off. Iran is also reportedly cooking up plans to send other animals into the final frontier. Last month, for example, Iranian space official Mohammad Ebrahimi told state media that a Persian cat could be launched atop a liquid-fueled rocket as early as March 2014. Iran's space ambitions concern officials in the United States and allied nations, as rockets used for such launches can be repurposed fairly easily into intercontinental ballistic missiles. "Any space-launch vehicle capable of placing an object in orbit is directly relevant to the development of long-range ballistic missiles, as well as SLV [space-launch vehicle] technologies, and they're all virtually identical and interchangeable," U.S. State Department spokeswoman Victoria Nuland said in late January, after Iran's latest suborbital monkey launch. Whether or not that launch was actually a success, Iran has notched some notable space milestones recently. The Islamic Republic launched its first satellite to orbit in 2009, for example, then lofted Earth-observing craft in both 2011 and 2012.